Get fully immersed in the breathtaking big screen experience of Cilea’s “Adriana Lecouvreaur.” Fathom Events and The Met: Live in HD — an Emmy and Peabody award-winning series — present the live broadcast of the opera in select AMC theatres nationwide on Saturday, January 12, followed by an encore showing on Wednesday, January 16. 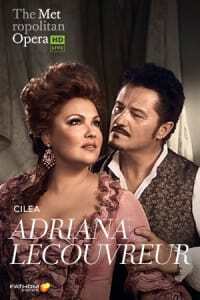 For the first time at the Met, Anna Netrebko sings the title role of Adriana Lecouvreur, the great 18th-century actress in love with the military hero Maurizio, sung by Piotr Beczala. Gianandrea Noseda conducts Cilea’s tragedy, directed by Sir David McVicar, with the action partially set in a working replica of a Baroque theatre. The cast also features Anita Rachvelishvili as the Princess of Bouillon, Adriana’s rival for Maurizio’s affections, and Ambrogio Maestri as Michonnet. The Financial Times said this is “the finest cast the production has yet seen.” Don’t miss the live broadcast of Cilea’s “Adriana Lecouvreaur,” January 12, or get your tickets to the encore showing, January 16, at an AMC near you. Enjoy up to $5 off each ticket when you buy adult tickets to three or more different performances of The Metropolitan Opera, only available at the AMC box office.